Paizo's 2014 Free RPG Day offering is now available as a free PDF over at Paizo's webstore. 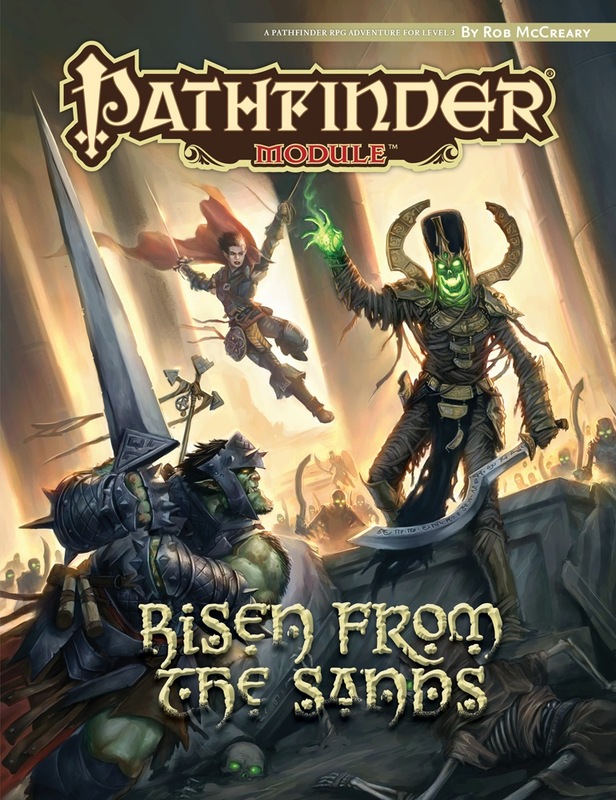 Risen from the Sands is a bit of a soft introduction to the current adventure path. The deserts of Osirion—land of pharaohs and ancient tombs—hide not just untold wonders, but also unspeakable dangers. When the vast sand dunes part to reveal the ancient pyramid of the legendary Pharaoh of Sphinxes, glory seekers from across many nations race toward it, each fighting to be the first to claim its wonders. But the storied pharaoh doesn't rest quietly within this monument, and his tomb was designed to slaughter any who would dare trespass. A band of bold adventurers are the first to arrive, and stand poised to claim what’s risen from the sands—but they're unaware of the doom that lurks inside. With daring on their side and strange, rarely seen powers at their disposal, the heroes may be the only force capable of containing the force of evil within and defeating its curse! upcoming Pathfinder RPG Advanced Class Guide, as well as a thematic supplement to the new Mummy’s Mask Adventure Path.